Baby Mama: 10 Things on a Monday. 10 Things on a Monday. It is so hard to blog in the summer. I love being home with the boys, and it is more amazing that Ryan is home too, but it sure is hard to get a moment to myself. And my house is a disaster. It's nice that there are so many things to play with, but seriously. 1. We got new carpet. Who knew this would be so exciting, but it is. Makes the whole house look better. 2. My friend Taylor came over to give me some inspiration to give our bedroom a little pick me up. Right now it is boring. B-O-R-I-N-G. Just white and gray. It definitely needs a pop of color. I can't wait to see what she comes up with. 3. I HATE when people on Facebook use "your" when they really mean "you're." It makes me want to get off The Book. I can handle the dumb political rants and over-sharing, but I cannot get over that mistake. I like Instagram better than Facebook anyway. I don't feel as strongly about the grammar because the pictures are so pretty and distracting. However, I am so nervous right now that I have made the "your/you're" mistake in this post because I'm complaining so much about it. 4. I find it almost impossible to shower daily during the summer. I am teaching and practicing a lot of yoga so I can't figure out the point if I am just going to get sweaty again. Plus, the thought of drying my hair is exhausting. 5. I have so many books to read, I just can't wait. I also can't wait until pool time means me laying on a chair, getting a tan, and reading a book. Now pool time is devoted to making sure no one drowns. 6. 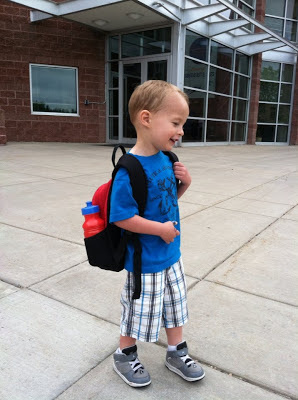 Paul is loving school which is such a relief. He comes home with an art project and is now singing to himself all the time. He looks so cute in his backpack, it kills me. 7. 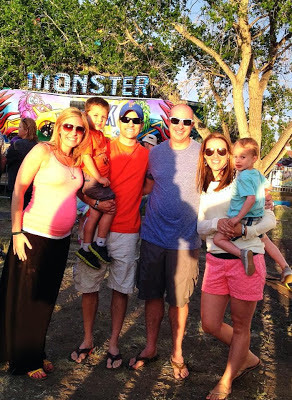 We went to Parker Days a few weekends ago with our pals and the boys LOVED it. There was a monster truck ride, a roller coaster, and a merry go-round. They were in heaven. There was beer for the adults, so it was a win for everyone. 8. Today, Paul asked me if I remembered Charlie being born. In fact I do. He said he remembered going to the hospital and kissing Charlie's face. So sweet. Then he said he loved Charlie because he was his brother. I die. 9. Ryan has started to do more yoga and is really liking it. We have a yoga date every week to sweat all our bad decisions we've made within the previous seven days. 10. I cleaned out my entire closet by trying everything on that I own. It was a project. I found some gems, things I couldn't wear last summer because I was pregnant and had totally forgotten about. Then I had to throw some things out that I couldn't even believe I owned. What was I thinking? I sent a huge bag to TWICE. I haven't heard back, but a few extra bucks wouldn't hurt anyone. That's it for now! I love looking back on this blog to remind me of all of Paul's milestones and what we have done. I am going to try hard to continue recording our memories. Plus my grandma sent me a letter and said she loved the blog to catch up with the boys. I never want to disappoint my GAZ! !